In this step, you are supposed to get rid of all the mess you have got cluttered in your bathroom. Just put the dirty towel and laundry in the pile, throw garbage out and try to organize the scattered items. In case you find something inside that doesn’t belong in there, just keep it aside and you can deal with it later. The next part of the same phase is that you need to pre-treat the surfaces of bathroom tiles and also the toilet. For that, you can use the most suitable bathroom cleaner and spray it over. This should be done with the help of mop hole and microfiber cloth. Properly clean the upper areal of your bathroom first so that you can keep up the perfect top-bottom cleaning strategy. Using the microfiber cloth, you can also tackle the vents of your bathroom so that you get done with most of is in one go. Precisely, this particular step entails the dusting, cleaning as well as polishing. Don’t forget the mirror when you are going from high to low. Just wet your microfiber cloth with a little bit of water and cleaning the mirror in S pattern to the mirror is properly cleaned. 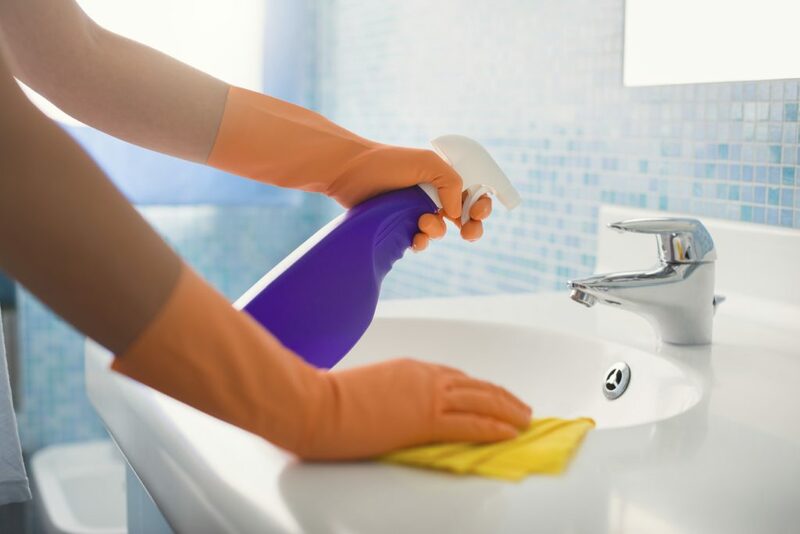 It’s important to clean the wide surface or counter you have your wash basin settled upon where the plenty of bathroom accessories are also placed. Just remove all the items, spray that surface and clean it in S Pattern. After you are done with this, just place each item nicely. Since you are up to having a perfectly clean bathroom, just wipe & clean the cabinet doors so that you are left with no loopholes to your swanky bathroom. It’s time to put a fine end to the pre-treated when you sprayed the surfaces of toilet, bathroom tiles, wash basin and even the tub. Just clean them properly with a micro fiber cloth, rinse a little bit and then just dry it them all with another piece of cloth. Spray a disinfectant over the microfiber cloth and wipe down all the points of contact like door handles, cabinet knobs and the flush. Last but not the least, clean the bathroom floor. Just use the water and vinegar solution and spray over the floor so that it helps remove dirt quickly. Don’t use mop since it’s the small area. Instead, you can use the microfiber cloth to do that with the same S pattern and you are done. Congratulations. Cleaning the bathroom might be a bit of hassle but how about some useful tips that can help you clean your bathroom in an effective manner. Just check out this article.